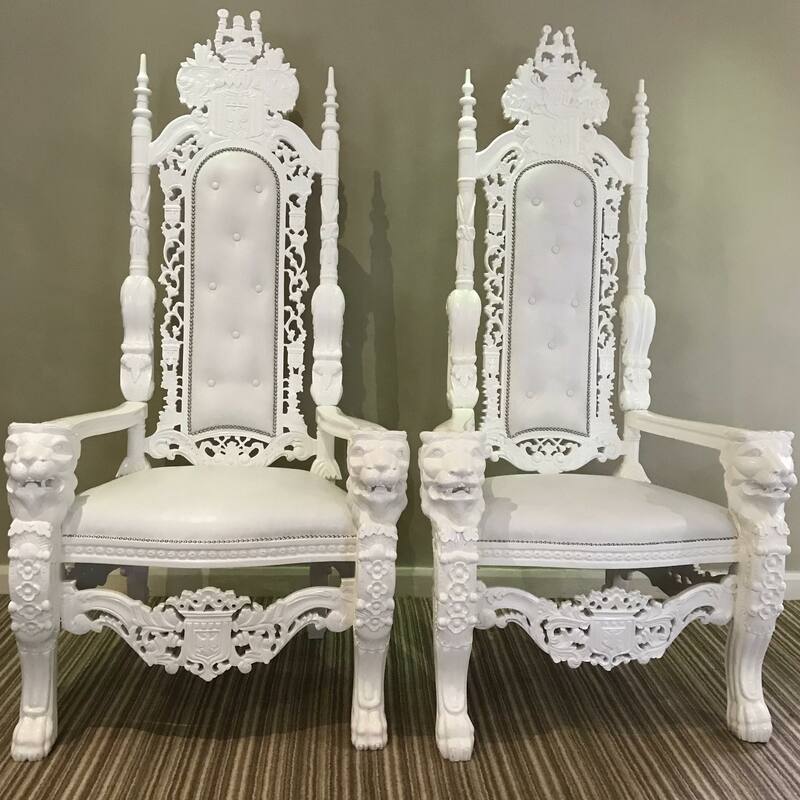 Thrones will add some elegance to your Wedding Day & are perfect for the head table. 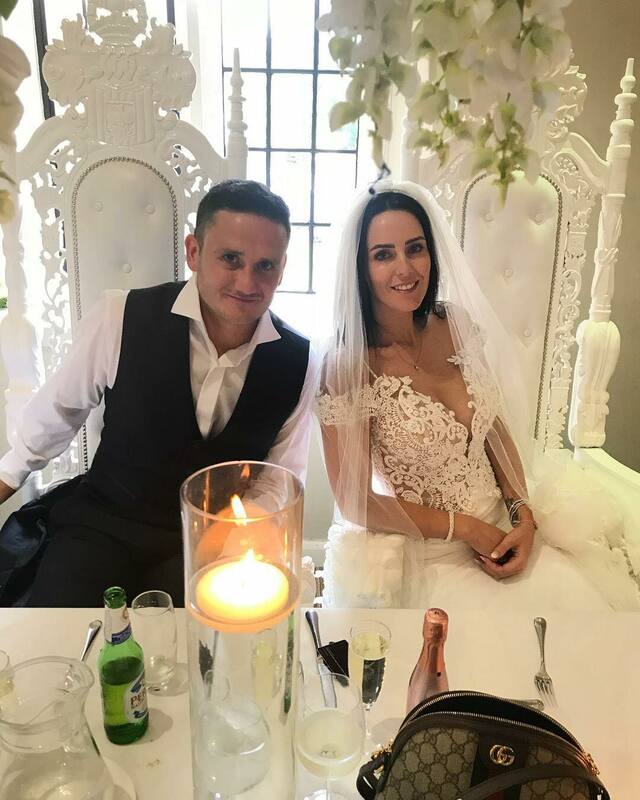 Popular with guests who all want to sit in them for a picture selfies. These are made from Mahogany & are a quality piece of furniture. These quality pieces are white on white & appeal to most weddings/colour themes. We recommend booking these with the full Twinkle Backdrop package which will get you a stunning head table. The thrones have lions carved into the arms & some stunning carpentry skills. 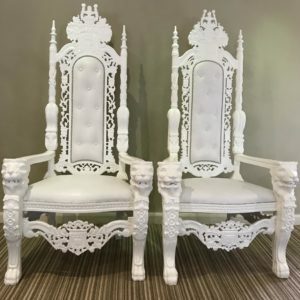 We will be adding to these in the future with another 2 white thrones of a different style so watch this space. We will deliver, position them wherever you need them, before picking them up again at the end of your event. They have star appeal & have really grown in popularity since David & Victoria Beckham had them for their Wedding as well as many other celebrities. If you need them for a photoshoot or to hire them over a longer period this can be arranged. We can do you a custom quote for long term rentals which will obviously give you a better rate due to the length of the contract. We regularly maintain all our equipment here at Killa Party & these pieces are sent for a repaint whenever we think it’s needed. We only hire out quality pieces so rest assured you will receive a great product that looks sharp & is great value for money. Remember if you are making a list of services to hire from us once you have over £899 on your list then everything you add to it receives a 25% discount. This will save you £60 & mean for both they will only be £180 which is a fantastic price.